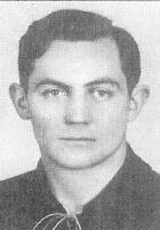 László Cseh also know as Cseh II was a Hungarian football player. He was famous with played with MTK Hungária. Cseh was the most skillful dribbler of the time and Hungary footballing artist. Cseh was a " Dribbling King " with intelligent and well know as Inside and Wing Forward, a technically gifted and thoughtful player. For tactical reason he played as Centre Forward only occasionally. He played 34 times for Hungary national football team between 1932 to 1939 and scored 15 goals.